If you follow my Facebook, then you know that I’m wrapping up a big renovation at my house. It’s been lots of dust and plastic since early February but now we’re putting the furniture in place and inviting over guests! Since this is a new blog, I will backtrack here a bit to tell you about the project. As I’ve mentioned before, after my divorce I was lucky to buy a wonderful 1880s colonial right near the Colonial Inn. 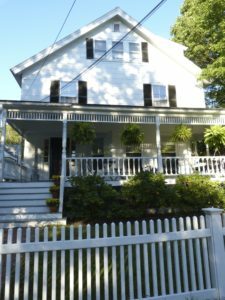 It has a prime Concord center location, a huge front porch, white picket fence and lots of charm. There’s a postage stamp sized yard – which happily minimizes both raking and mowing! Most importantly, the two family house brought me rental income that was very helpful as I got settled into my life’s own unexpected “fresh start” and my girls began college. The house was originally a single family (there’s always been only one front door) but was converted into a two family in 1971. For some time the house was actually owned by the Colonial Inn (two doors away) and the apartments rented to hotel guests. The first floor unit was a one bedroom /one bath apartment with a tiny galley kitchen. It had an amazing “V” shaped (original!) fireplace that faced a spacious open living and dining area. Upstairs, a 3 bedroom/2 bath apartment was carved out of the original home’s bedroom configuration. In total, the house is just under 3000 SF. When I bought it, the two family configuration worked out perfectly for me. I rented out the first floor unit and lived upstairs. The girls and I all had our own bedrooms and separate baths. Even though we were upstairs, we had a cozy living room with a fireplace! Along the way someone had even added central air to the house. The 2nd floor kitchen was quite small – with one short expanse of counter top – I liked to call it a “Parisian” kitchen. I did a renovation before moving in but overall the setup was good. In the first months of ownership, I put in a new HVAC system, converted to gas heat and removed all the old steam radiators (which ate up my precious wall space). I completely update the 3rd floor bedrooms with new shiplap walls, new ceilings and carpet to cover the old attic floorboards. I also took down a non-load bearing wall between two rooms so I would have an open living room/dining room space. Jump to two and a half years later. As someone who loves to cook, the limited 2nd floor kitchen and small entertaining space for holidays and family gatherings was starting to get to me. I was longing for more space and a home of my own again. With real estate comps showing that the house was likely worth more as a single family than as a two family, I decided to take the leap to bringing it back to a single family residence. I started planning this renovation in earnest last Fall. In February, I brought back the same team that helped me on my first renovation. We took the bedroom from the first floor apartment and transformed it into a wonderful new kitchen. The bedroom closet is now a new walk-in pantry. An old unused staircase is now a built-in for the microwave, cookbooks, mixing bowls etc. Using a 9′ beam we opened the kitchen space up to the large living and dining room. The galley kitchen that had served the 1st floor apartment is now a butler’s pantry and laundry room. (Laundry was previously in the unfinished basement). We swapped out the stove and refrigerator for a front loading washer & dryer. We kept the original kitchen sink, second dishwasher and cabinets so I have ample space when entertaining. Upstairs, the “bedroom” that had served as my “Parisian” kitchen has gone back to its former life as a bedroom. And, because I had the whole crew here anyway, I am also completely updated my master bathroom on the second floor. There was a tiny tub, no storage and zero insulation. Now I have a big shower, double vanity, recessed medicine cabinets and a luxurious towel warmer. Plus insulation. My second floor living room stayed put as a den/tv room and the former dining space up there is my new home office. I am excited to share the “Before & After” photos with you of the transformation! We are just finishing up the final construction and decorative details now! Please check back for photos!